Success in the changing world of visual communications means projecting brighter, bolder, more creative images in the largest, most sophisticated venues. That’s why we work so hard to develop innovative, versatile projectors that push presenting and visual projection to the next level. Our commitment to product quality, technology, relationships, and service and support is the reason we have been the market leader in projectors for over 14 years1. Modern audiences have high expectations, so expand your creativity at big events and attractions with features including portrait and split-screen projection, 360-degree installation and projection onto floors, ceilings, corners and curved surfaces. 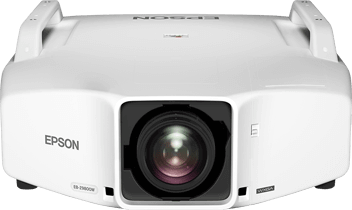 From education environments and art galleries to digital signage and corporate events, from in-house projector fleets to the rental market, Epson projectors are the smart, effective solution. Your peace of mind is a key goal, so as well as building rugged products that last, we offer you a range of service and support options that cover your projectors while you concentrate on being creative for your customers and audiences. From pre-sales advice to ongoing assistance and access to expertise, our standard and CoverPlus 365 warranties give you large-scale ongoing backup that works. We research, develop and manufacture every part of our projectors to ensure superb image quality, ease of operation and reliability. 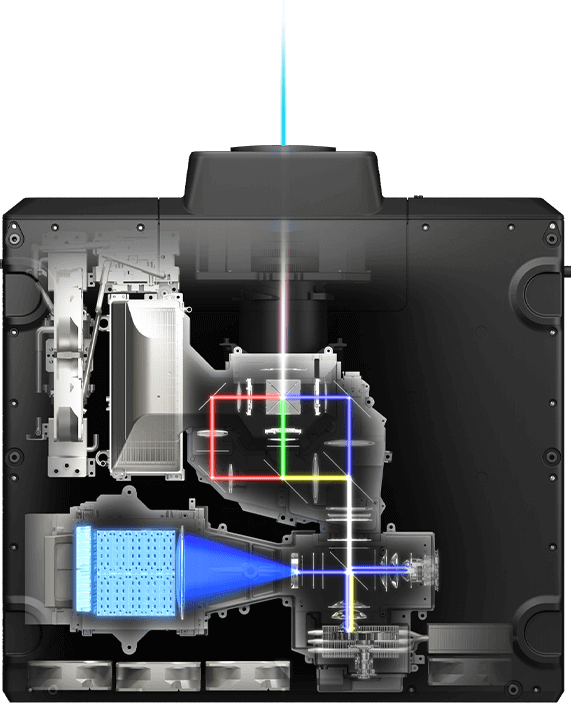 Our 3LCD technologies produce images that are three times brighter than single-chip DLP projectors2, and the inorganic light engine in our laser technology helped create the world’s brightest 3LCD laser projector3, the EB-L25000U. Meanwhile, developments such as 4K enhancement prove our dedication to taking projectors into the future. Our projector range has the flexibility to meet your needs and bring extra quality and creativity to just about any venue. Our versatile set up and connectivity features make great presenting easy and include 360-degree installation, simple networking and total control. Our wide range of lens options have the power and flexibility to enhance any subject, with features including motorised adjustment, memory function and an ultra-short-throw zero-offset lens that can project a 200-inch image from just 1.5m away. We work closely with customers and partners to build ongoing relationships that grow with your business. Your feedback helps us to tailor our products to your changing needs and to define the future of your business environment. This results in unique innovations such as our inorganic LCD panels and phosphor wheel for outstanding light and heat-resistance and added longevity. Our uncompromising commitment to manufacturing quality and meticulous design detail adds power to your presentations. Whether you choose our acclaimed lamp-based models or our latest laser projectors, you can rely on a level of quality that consistently leaves our competitors standing. Show your audiences the future of projecting with 4K enhancement technology5. This technology allows you to watch 4K content or digitally upscale Full HD 1080p imagery, shifting pixels diagonally by 0.5 pixels to effectively double resolution. This gives viewers a 4K experience with improved texture and exceptional sharpness, clarity and detail. Building on the success of the world’s first 12,000lm 3LCD laser projector4 (EB-L1500U/EB-L1505U), the new EB-L25000U boosts brightness to a stunning 25,000lm. The inorganic LCD panels and phosphor wheel have outstanding light and heat-resistance, to deliver superb quality, reliability you can count on, and bright, vibrant images for very long periods. Epson projectors are built to excel in challenging environments. The EB-L25000U delivers flawless performance even in dusty or smoky conditions because key components including the inorganic panels, inorganic phosphor wheel and laser bank are housed in a sealed structure. It also has a pipe frame and base plate structure to greatly improve casing durability. We are committed to remaining world number one for projectors1, with 70% of our Research and Development team of 1,100 engineers dedicated to projectors. We never stop working to find ways to give you the latest in quality, reliability and flexibility. Our three-chip solid-state optical engines deliver vibrant realistic images, and optimise white balance and black colour-matching for seamless blending. Equally high white and colour light output means that images are not only extremely consistent, they are also three times brighter than one-chip DLP projectors2 with no rainbow effect. Match brightness levels to your situation with more precise adjustment in increments of 1%, and maintain specific levels over a prolonged period of time with constant brightness mode5. This is useful in places like art galleries where consistent, accurate projections reflect the artist’s vision. Achieve up to three times the colour gamut of one-chip DLP projectors with Epson’s HTPS panels. 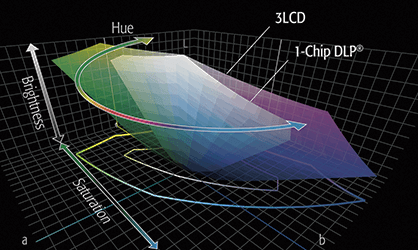 This core technology produces more vibrant colours with more accurate colour reproduction. You can also adjust hue, saturation and brightness for each colour in the RGB and CMY colour models. Our technological innovations give you the power to project images that outclass the competition, and our latest laser projectors represent another big step forward in brightness, flexibility and reliability. Whatever your needs and budget, you’ll have the creative freedom to entertain and inspire. Enhance your presenting possibilities with 360-degree installation, and project from any angle with no loss of brightness or image quality. Being able to install your projector just about anywhere, in any orientation, brings floors and ceilings into play so you can create images in surprising places that really capture attention. Keep images consistent and maintenance to a minimum with the innovative camera built into our laser projectors. It detects images that have become uneven or discoloured over time and notices subtle inconsistencies between multiple projectors, then makes necessary adjustments to ensure smooth, accurate, uniform projections. Panoramic and portrait projection are ideal for fashion shows and product launches. Create seamless multi-projector images on one giant screen or use portrait mode to bring out the best in digital signage and displays. Edge blending and scaling perfectly match each image in terms of brightness and colour, with no visible joins. A wide range of way to connect to devices, lens memory storage, web control and networking make it simple to get set up and integrated. This includes wireless networking and HDBaseT for Full HD audio and video control from up to 100m away with a Category 5e cable, ideal for large venues. We design everything to make presenting as smooth and as simple as possible, with a lens memory feature that stores up to 10 settings including lens shift position, focus and projection sizes. This makes it easy to adjust the projector to match the aspect ratio of your content. Use features such as EasyMP Network Monitor to monitor and control projectors, with fleet control across a network or on a web browser to keep track of up to 1,000 projectors. The latest models feature a newly designed OSD Control Pad function that shows a representation of lens conditions on a smart device. Choose the ideal lens for your presenting environment from a wide range of easily interchangeable, motorised options suitable for many models. These maximise quality and versatility and make it easier to use an existing ceiling or wall mount. The ultra-short-throw zero offset lens can display a 200-inch image from only 1.5m away, making it ideal for small spaces. Take your visual creativity to the next level with our breathtaking laser installation projectors. Enjoy unprecedented imaging power and the latest exclusive Epson technologies, and impress audiences with the future of large scale presenting. 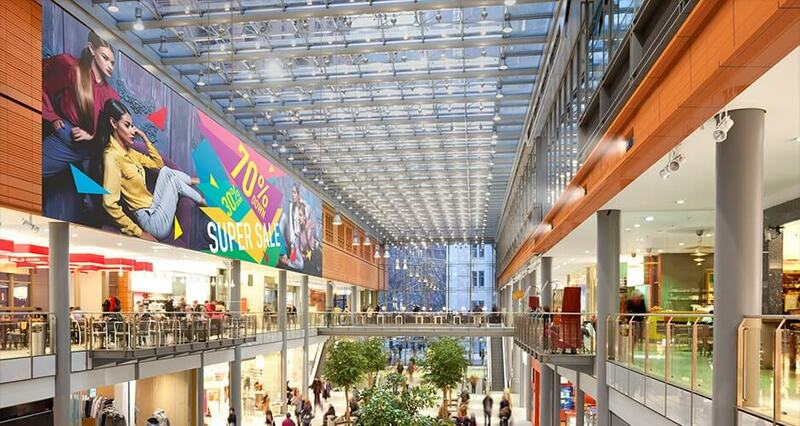 Transform the way your audiences look at corporate and higher education presenting, visitor attractions, museums and galleries and stunning digital signage at shopping centres, sports events and more. Our new laser projectors prove that we never stop driving the world of presenting forwards. 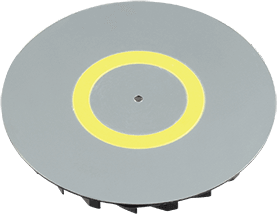 Our newly developed inorganic phosphor wheel has superior light and heat-resistance and delivers excellent reliability. This works perfectly with our inorganic LCD panels to produce bright, vibrant images for extremely long periods. A light source that is maintenance-free for 20,000 hours is one you can rely on. Our projectors keep you working even in environments where dust and smoke may be common, thanks to the specialised sealed structure of the EB–L25000U which maximises image quality as well as reliability. Project truly stunning images easily and make a big impact at a very wide range of venues and events with presenting flexibility to match. With very high reliability and almost no maintenance these projectors can handle the busiest workloads. Our laser projectors have redefined image quality, from the world’s first 12,000lm WUXGA 3LCD laser model4 (EB-L1500U/EB-L1505U) to the world’s brightest 3LCD laser projector, offering 25,000lm brightness (EB-L25000U)3. 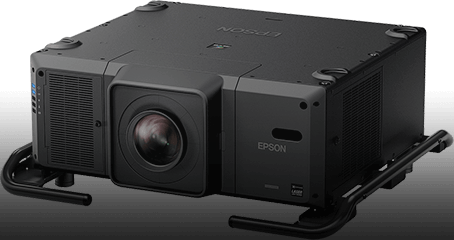 This, combined with the improved texture and exceptional sharpness, clarity and detail of features like 4K enhancement keep us at the cutting edge of projector technology. Optional motorised lenses make it easy to find the perfect match for your subject and venue, while lens memory recalls settings for even faster setup. Choose from a wide range of lenses including an ultra-short-throw (UST) zero offset lens6, which can project a 200-inch image from only 1.5m away. A choice of lenses make it simple to use an existing ceiling or wall mount. Our laser projectors give you extra creative potential in the widest range of presenting venues. 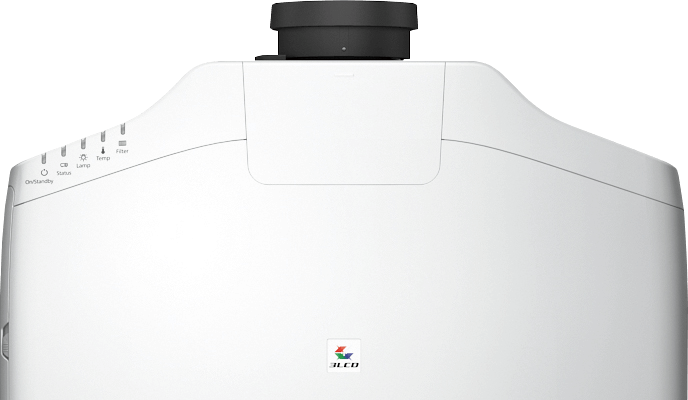 The EB-L25000U is smaller and lighter than competing projectors7 for easy installation, while all laser models offer 360° installation and wide lens shift. This means you can project in any direction and use extensive adjustment to create perfect images on just about any surface. Portrait projection is simple, and when you use multiple projectors to create an even bigger image, edge blending makes joins invisible5. Create stunning visuals at any venue on a very big scale with a groundbreaking combination of 25,000lm brightness, beautiful images, extreme reliability and flexible presenting options. This model is compact and lightweight but also highly durable and robust. 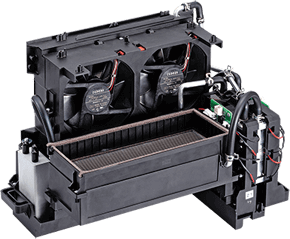 Featuring a sealed optical system for enhanced performance in dusty or smoky environments and a combined water and air cooling system for enhanced reliability. Our laser projectors have redefined image quality, from the world’s first 12,000lm WUXGA 3LCD laser model4 (EB-L1500U) to the world’s brightest 3LCD projector with 25,000lm (EB-L25000U)3. This, combined with the improved texture and exceptional sharpness, clarity and detail of features like our 4K enhancement technology, keep us at the cutting edge of projectors. Optional motorised lenses make it easy to find the perfect match for your subject and venue, while lens memory recalls settings for even faster set up. Choose from a wide range of lenses including an ultra-short-throw (UST) zero offset lens6, which produces a 200-inch screen from only 1.5m away. A choice of lenses also makes it simple to use an existing ceiling or wall mount. Our laser projectors give you extra creative potential in the widest range of presenting venues. The EB-L25000U is particularly compact for easy installation, while all laser models offer 360º installation and wide lens shift. This means you can project in any direction and use extensive adjustment to create perfect images on just about any surface. Portrait projection is simple, and when you use multiple projectors to create an even bigger image, edge blending makes joins invisible5. 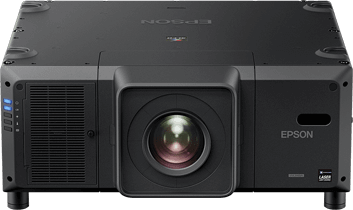 Our lamp-based projectors have been industry leaders for many years, offering the power to redefine the way business and education professionals communicate with audiences. From lecture halls or auditoriums to art galleries or publicity events, Epson projectors have been at the heart of the move into truly versatile digital communications. 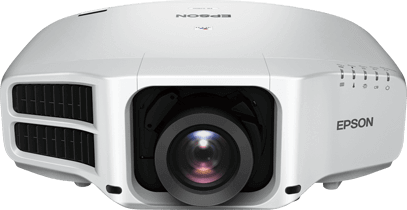 These hassle-free, flexible smaller venue projectors deliver bright, clear images in corporate and education environments. Choose from a range of resolutions up to WUXGA, very easy setup and operation and flexible features including split screen and remote management. Harness the power of an installation projector with effortless simplicity. Our projectors offer outstanding projections with brilliantly simple setup, features and operation. Our rugged and reliable projectors are ideal for permanent installations, but also surprisingly compact. This means they fit seamlessly into any hard-working rental fleet, with changing venues and users. Project a perfectly uniform image, enjoy flexible installation options and precision control with wide lens choices and adjustment, image optimisation and manual and automatic controls with lens shift and keystone correction. Add versatility with 360-degree installation. Work quickly by broadcasting directly from your Android device or latest Intel computer onto the screen with the Miracast Screen Mirroring protocol. What you see on the small screen is what you’ll get on the big screen. Project your HD content using a variety of HD devices via the HDMI input. Make fast connections regardless of venue or network setup with interfaces including HDMI, DVI, HDBaseT and component video. Multiple users can connect simultaneously to one projector using EasyMP Multi-PC Projection, with up to four user screens displayed at any one time. Present from two different sources simultaneously with the side-by-side split screen function. Compare and contrast information from a separate laptop or Epson USB Visualiser for 3D image projection. The easily replaceable lamp and filter help to keep maintenance to a minimum, ensuring that your projections remain bright and clear for longer. Take control with Epson EasyMP tools for smart presenting, networking and projector management, from PC-free and wireless presenting to centralised monitoring of your entire projector fleet. These top of the range lamp projectors bring exceptional presenting power to the installation and rental markets. They combine quality, a selection of models to suit your needs and a range of value added features from edge blending to Epson EasyMP. Harness the power of an installation projector with effortless simplicity. Our lamp projectors offer outstanding projections with brilliantly simple setup, features and operation. Our rugged and reliable projectors are ideal for permanent installations, but also surprisingly compact; meaning they fit seamlessly into any hard working rental fleet with changing venues or users. Project a perfectly uniform image, enjoy flexible installation options and precision control with wide lens choices and adjustment, image optimisation and manual and automatic controls with lens shift and keystone correction. Add versatility with 360° installation. Project your High-Definition content using a variety of HD devices via the HDMI input. Make fast connections in any venue and network setup with interfaces including HDMI, DVI, HDBaseT and component video. 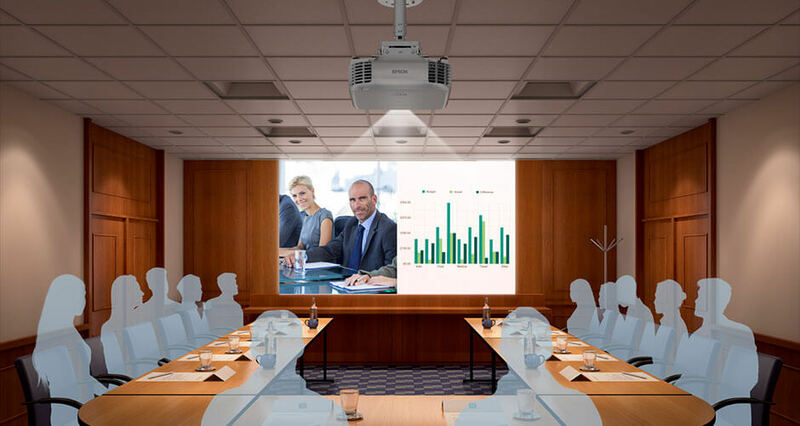 These projectors have everything you need to transform installation venues with powerful, professional-looking presentations. Combining high image quality and a range of resolutions up to WUXGA with flexible installation and lens options and hassle-free maintenance. Every environment and every presentation is different, so we offer a wide range of accessories to meet your needs. From filters, lamps and ceiling mounts to screens and lenses, we make it easy to tailor your projector package to match your environment or audience. Customise your installation projector with Epson’s optional lenses. Available in a range of throw ratios to suit different venues, screen sizes and projector distances, different lenses give you the option to maximise image quality without breaking your budget. 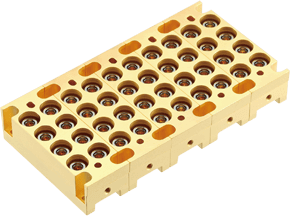 Optional lenses are available for the EB-G7000 Series, EB-L1000 Series, EB-L25000U and EB-Z10000U Series. Extend your reach even further with this wireless video/audio extender. It’s easy to install and has three inputs: HDMI, LAN and RS-232 for output to a CAT-5/6 cable. Make fast, secure wireless presentations via EasyMP Network Projection or Epson’s iProjection app, with the help of this easy installation USB adapter. Guarantee the best, brightest and most consistent images for longer with genuine Epson lamps. They are manufactured and shipped under rigorous quality control systems that guarantee the best image quality, maximise reliability, minimise maintenance and ensure ongoing comprehensive warranty cover. Fit your projector to your venue perfectly and ensure flexibility, safety and security with our tailor-made ceiling mounts. Ceiling mounts are available for the EB-L1000 Series and EB-G7000 Series (ELPMB47, ELPMB48); EB-Z10000U Series (ELPMB25, ELPMB26); and EB-4000 Series (ELPMB22, ELPMB30). 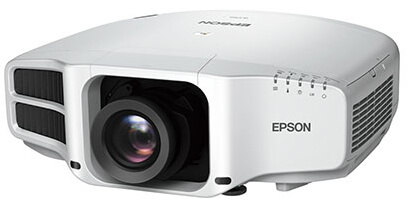 Genuine Epson ultra-high efficiency projector lamp. Building strong relationships helps us to give you targeted projector solutions and the finest ongoing service and support. The best relationships work both ways, so we listen to our customers and your audiences, and use what we learn to develop future products. Great reliability comes as standard, but relationships help both of us to build on our success and to stay at the cutting edge of our businesses. Our optional CoverPlus 365 warranty delivers true round-the-clock backup to cover just about any eventuality. This exceptional programme is designed to keep you presenting with a range of features including direct access to trained experts, and advice and assistance before, during and after sales. It also offers replacement projectors, lamps and filters for on-site swap out, and onsite maintenance training. Our large scale service capability gives us the power to respond and act very quickly should you need us. We work very closely with our channel partners, while our extensive sales force and dedicated end user and corporate teams give you a wide network of contact points for all aspects of sales, service and advice. Genuine Epson lamps deliver high brightness and excellent colour to give you maximum performance and quality. These lamps are manufactured and shipped under rigorous quality control systems to ensure a long, trouble-free life. Our standard warranties are another point of difference between Epson and other projector manufacturers, covering you for an extensive three or five years (depending on product) or 20,000 hours of use, whichever comes first8. All of our projectors are built to last, and offer flawless ongoing performance with minimum maintenance. All projector parts are designed and built under meticulous conditions to ensure a long life, and easy maintenance and replacement, from our lasers (up to 56,000 hours) to our advanced filters (up to 30,000 hours). Our partner will help you to work out your requirements, the projector model and number of units* that’s right for your business. Once agreed our partner will process your request. Your projectors are delivered, set up and installed to your business requirements. Simply call the priority Epson helpdesk to register your projectors and request the swap out product. Epson will contact you to arrange onsite training for preventative maintenance. 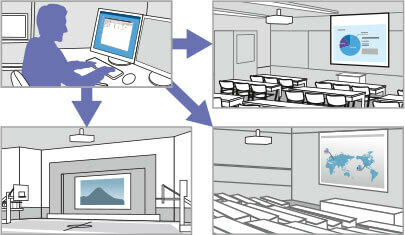 The swap out projector and where relevant lamp and filter, will be sent directly to you on completion of any training. You will receive ongoing help and support 365 days a year, resulting in minimum downtime caused by servicing and repairs. For the ultimate in home cinema experience or large scale projections, the right projector lens is key. Epson projectors lead the market with innovative technology, high quality images and performance. Don’t end up paying too much for your business projector. 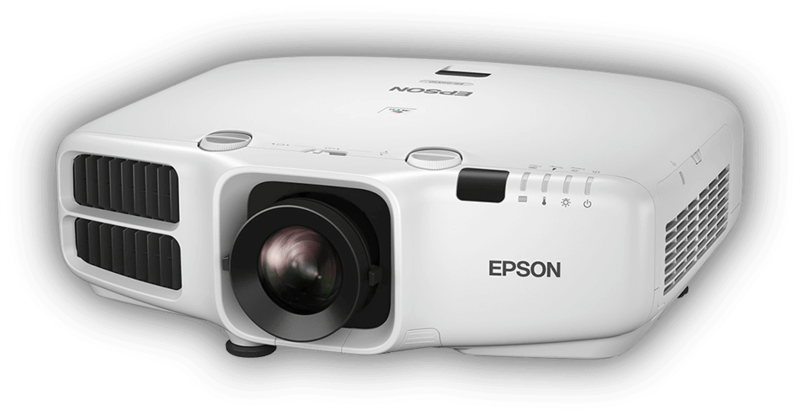 Use our total cost of ownership calculator to analyse the cost of an Epson projector. For more information on our Pro AV projector range, simply fill in your details below and an Epson representative will be in touch. 2 Colour Brightness (Colour Light Output) measured in accordance with IDMS 15.4. Colour Brightness will vary depending on usage conditions. Leading Epson 3LCD business and education projectors compared to leading one-chip DLP projectors, based on NPD data for June 2013 through May 2014 and PMA Research data for Q1 through Q3 2013. For more information please visit www.epson.co.uk/clo. 3 Brightest 3LCD projector as of September 2016. Some short-throw and ultra-long-throw lenses will not produce 25,000lm. 4 The EB-L1505U/EB-L1500U is the first and only 12,000lm WUXGA 3LCD laser projector on the market as of December 2015. 5 Not available on all products. 6 Warranty offers are not available for all countries. Please contact your local Epson representative. 7 As of September 2016. 8 Available on the EB-L1100U, EB-L1200U, EB-L1300U and EB-L1405U.